In Colombia many people have the tradition of buying a whole pig at the butcher store and use it to make different types of food to celebrate the holidays. 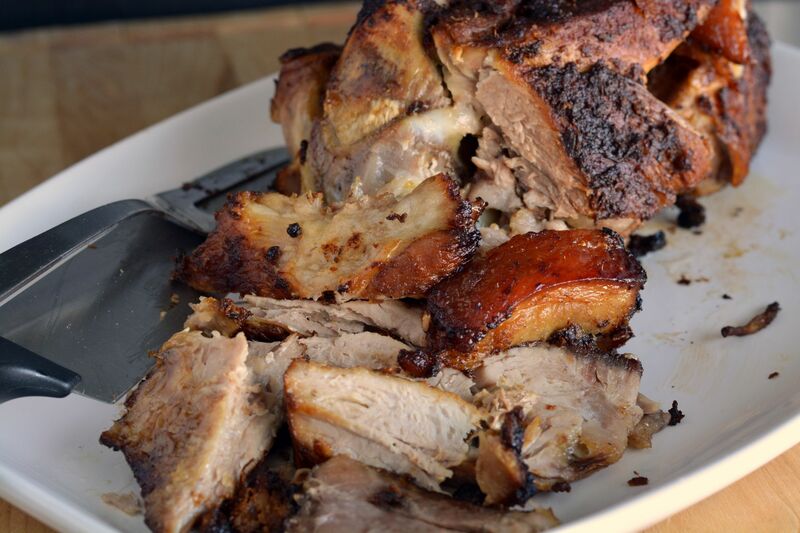 They make tamales with pork meat, lechona (roasted pig), pork tenderloin, sausages, blood sausage, fried pork belly, beans with pig’s feet, and of course, this pernil or ham with lots of Colombian flavor. To be honest, I usually don’t use a raw ham for this recipe. (What?!) That’s right. 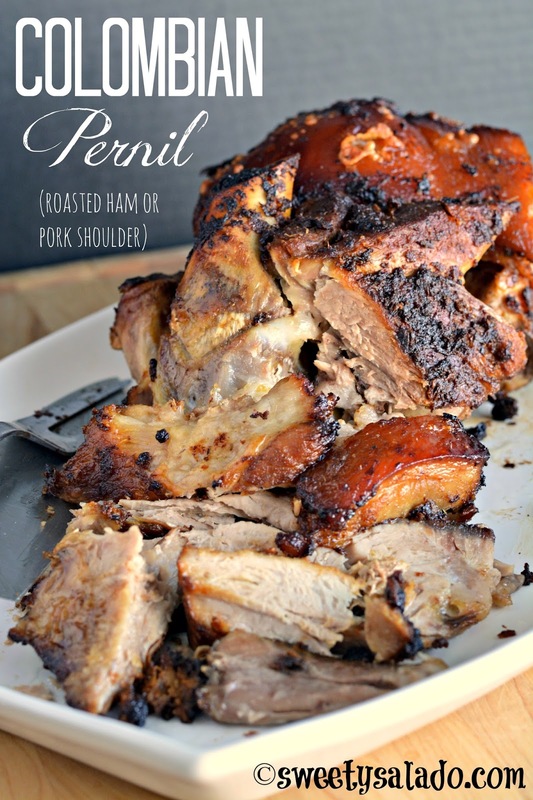 I think it’s way too much meat for my small family and that’s why I do what most Puerto Ricans do with their own version of pernil and use pork shoulder instead. It’s not the exact same cut of meat, but truth is, it comes out tasting the same. 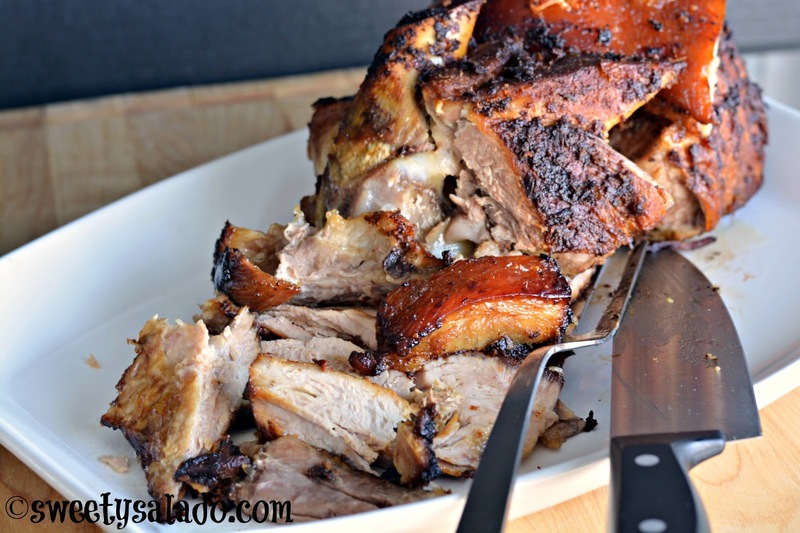 I personally have tasted different pernil recipes and they’re all delicious, but I always end up loving this one more because the beer, which by the way, we use a lot to marinade meat in Colombia, gives it a very unique flavor. Blend all the ingredients (Except the pork) in a food processor or blender to make the marinade. Place your pork in a big glass or plastic bowl. Then, with a sharp knife make incisions all over the meat. Add the marinade in the incisions that you made to make sure the meat is well seasoned from the inside out. Then pour the rest of the marinade all over the pork, cover with plastic wrap and refrigerate for 1-2 days. Make sure to turn the meat over every 8 hours. Pre-heat your oven to 325ºF (163ºC). Take the pork out of the refrigerator and let it rest on the counter for about 30 minutes. Then, place it in a roasting pan with the marinade. Cover it with aluminum foil and place it on the lower rack of your oven. Roast for 4-7 hours or until the internal temperature reads 160ºF (72ºC). Baste the pork with the juices that are in the pan to make sure the meat doesn't get dry. The juices will eventually dry up as well, in that case, you can add ¼-½ cup of water to make sure your pork doesn't get burned. Remove the aluminum foil during the last hour of roasting so it can turn golden brown on top. Take the pork out of the oven once it's done and let it rest for 30 minutes before serving. How much olive oil and how much vinegar? Thank you for asking!!! I hadn't noticed that I skipped those two ingredients (feeling awful). The recipe has been updated now. Can't wait to make this. What type of beer do you recommend? Feel free to use your favorite type of beer. In all honesty, I just grab whatever we happen to have in the fridge. Having said that, a golden or blonde ale works really well.